Florida is the second largest strawberry producer in the US after California in terms of production, harvested area, and total yield. During the 2011 field growing season, 9,900 acres were harvested in Florida valued at 366, million USD (USDA-NASS 2012). Florida’s strawberry industry supply 100 percent of the domestically grown winter crop, producing during the months of November through March (Mossler and Nesheim 2007). It is therefore important to maintain high-quality production during these months in order to maintain profitability of this high-value crop in Florida. However, some of the limiting factors that face Florida’s strawberry industry including pest problems i.e. insects, mites, diseases, weeds and loss of methyl bromide (fumigant) (Mossler and Nesheim 2007). Twospotted spider mites, (TSSM), Tetranychus urticae Koch are the most damaging and persistent mite pest that affects field grown and greenhouse strawberries. 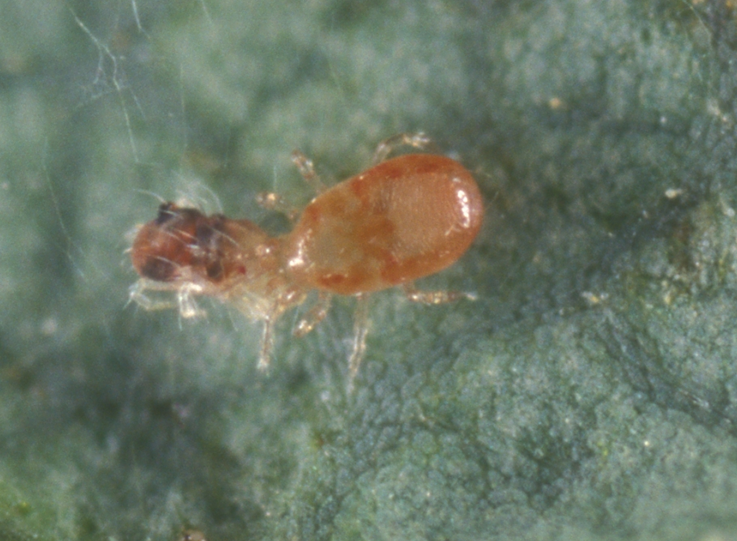 This pest was also mentioned in the Florida Strawberry Pest Management Strategic Plan (2007) as the main mite pest that is always a problem to strawberries in the state. 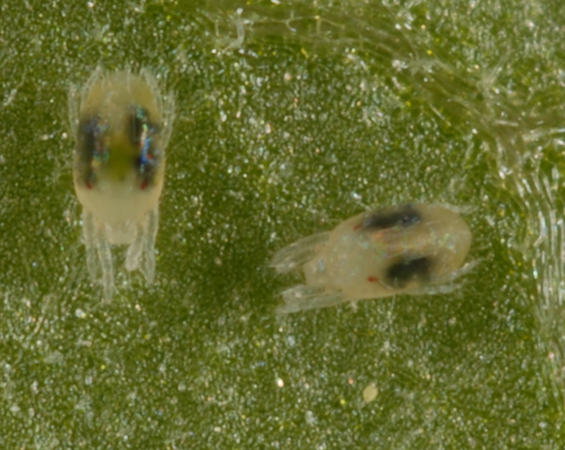 Spider mites are small, plant sucking mites that can severely damage the plant leading to yield loss. They cause damage on strawberry leaves by piercing leaf tissues and removing the cell contents thereby interfering with the leaves’ ability to make their food (photosynthesis). Under high infestations, TSSM can significantly affect plant growth causing a substantial yield reduction especially if plants are attacked early in the growing season (Rhodes and Liburd 2006). Spider mites usually inhabit the underside of the leaves and their presence may be overlooked until they cause detectable damage on the leaves. Spider mites appear in the field early in the growing season. They can be introduced into the field with transplants. Currently, TSSM monitoring programs require sampling strawberry fields using a hand lens to determine the number of mites that are present. This process is labor intensive and sometimes too expensive to implement under a large scale production system. In such cases, growers tend to apply pesticides (miticides) on a calendar-basis (every 14 days) and forego scouting to avoid losses. The application of miticides on a calendar basis is not a desirable practice because it is expensive and it eliminates natural enemies (beneficial insects) that regulate TSSM populations. Activities that are likely to improve TSSM monitoring and assessment on strawberries would greatly improve pest management in strawberries. Our project is proposing to develop a sampling program that will use remote sensing techniques for mite detection in the field. Briefly, remote sensing utilizes spectral characteristic of the plant to detect plant stress induced by mites and insects. This will reduce time and labor for scouting fields allowing growers to make management decisions (whether or not to apply pesticides). To manage TSSM, the use of chemicals (mostly miticides) is the most popular method. This approach is exclusively based on whole-field approach where pesticides are applied in a uniform manner across the entire field. It is however recognized that many insect pests are present in some locations and absent in others (spatially aggregated) in same fields (Davis 1994). For instance, TSSM are known to appear first along the field edges forming “hot spots” from where they spread across the field. Therefore, chemicals are frequently applied in areas where they are not needed while treating the entire field. We proposed to evaluate a new management approach where application of pesticides and or predatory mites will be done in areas where they are only needed. This would result in a significant reduction in amount of pesticides/predatory mites required to manage mites or other pests and also improving environmental health. This approach is called site-specific pest management. Site-specific pest management involves considerations for in-field variability in pest populations where management of the pest is based on a localized density within an area as opposed to treatment throughout the entire area (Park et al. 2007). The hand-held spectroscopy is supposed to be more efficient in mite detection and will eliminate the amount of time spent enumerating mites or even trying to observe them using a hand lens or microscope. A spectroscopy is a ground-based sensor that provides real time data and utilizes spectral characteristic of the plant to detect plant stress induced by mites and insects. 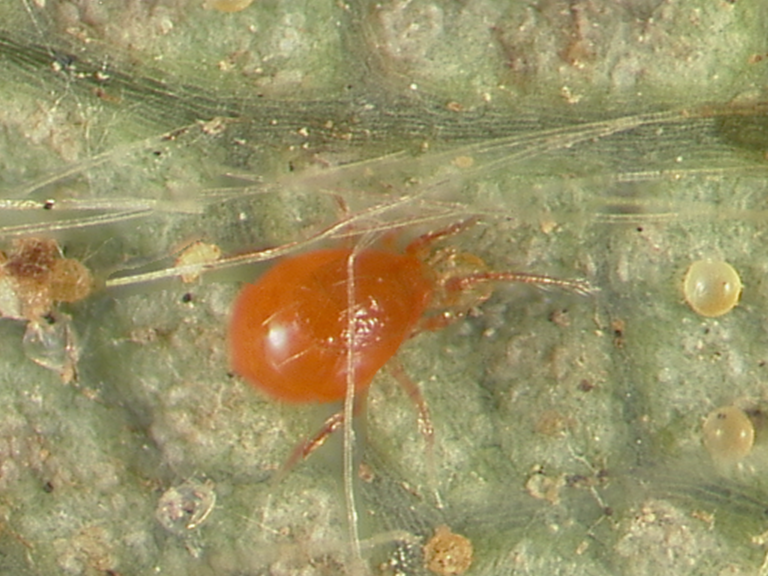 If adopted, spectroscopy would significantly reduce the amount time required to scout for pest and therefore large scale growers would be more enticed to scout for mites before spraying. This would therefore ensure that pesticides are only applied when needed, ultimately contributing to a healthy environment. This would impact a large number of growers as revealed by our recent survey. Most of the growers indicated that due to the small size of mites (about 0.4 mm in length), time involved in scouting and lack of trained personnel to identify the mites, they tend to spray on a weekly basis or bi-weekly to avoid losses. This approach does not take into consideration if mites are present or not before the spray are conducted. These growers also indicated to us they would be interested in trying another means of mite detection methods such as remote sensing (RS) techniques if available. Application of RS technique holds a potential in improving TSSM monitoring and overall management programs in strawberry production. Objective 2: To evaluate site-specific pest management of twospotted spider mites using a reduced-risk insecticide and predatory mites (N. californicus & P. persimilis) on field-grown strawberries. Because TSSM are known to occur in “hot spots” in the field, management actions will only targeted infested areas. Therefore prior knowledge of mite status in the field is required in order to guide management actions. Consequently, to effectively conduct an economic analysis to evaluate the cost savings associated with site specific pest management, a grower standard management program will be compared with spot treatments it will be demonstrated that a substantial saving of resources (labor, miticides, and energy) will result from site-specific pest management. Again, growers will benefit tremendously because of the cost savings. Additionally, pesticide-free strawberries will be available to consumers as more growers are likely to adopt the use predatory mites. Lastly, there will be added benefits to the environment due to the reduced use of pesticides, hence preserving the natural enemies (beneficial insects). Our goal is to work closely with growers, extension agents, crop consultants and other agricultural personnel to ensure that our practices are adopted. We propose to hold two field days during the spring and fall of 2012 to discuss the findings of our project with growers and other agricultural personnel. We will also give presentations during the fall strawberry meetings (2011 & 2012) highlighting the goals of our project and accomplishments. Our information will be disseminated using various media outlet including, newsletter, extension publications and websites. It is important that our study involves growers and extension agents in order to achieve our goals of demonstrating these new approaches for controlling spider mites in strawberries. OUTCOME # 1 for Objective 1: Increase the number of strawberry growers adopting and practicing Integrated Pest/Mite Management (IPM / IMM) on their farm. The goal of this project is to incorporate remote sensing into TSSM scouting and monitoring programs for field grown strawberries. Spider mite population monitoring and assessment are probably the most important aspects of good IMM practice. Knowledge of pest/mite status in the field leads to judicious use of pesticides or predatory mites; therefore, making use of these strategies only when necessary. The benchmark data comes from a preliminary survey that we conducted in 2009/2010 where growers were asked if they scout their fields for mites before making a spray application. Most growers indicated that scouting/sampling is very intense, and that they have difficulties in identifying mites due to their size. As a result spraying is done routinely (weekly or biweekly) on a calendar basis. Our target is to establish at least one on-farm demonstration experiment on a growers’ farm and another the University’s of Florida Plant Science Research and Education Unit, in Citra, Florida that will serve as a secondary demonstration site for strawberry growers in North-Central Florida. Growers will be taught hands on how to use a spectroscopy; a hand-held equipment for assessing mite population from strawberry leaves. They will also learn how to incorporate this information into mite management decision making guidelines. Performance measures will include the number of growers that will participate in the on-farm demonstration/workshop that we will conduct. OUTCOME # 2 for Objective 2: Decrease the amount of miticides used for spider mites control while increasing the number of growers using predatory mites. The second goal of this project is to increase the number of growers using predatory mites while reducing the amount of pesticides (miticides) used for spider mite control. It is already known that the main method of spider mite control is the application of miticides to the entire field under production. Similarly, if using predatory mites (only 25% adoption by 2007 Mossler and Nesheim 2007), the same approach is used where the beneficial mites are applied based on the area under production (usually per m2) as recommended by the manufacturer/supplier. Although these predatory mites have been reported successful in controlling spider mites, releases have been done even in areas where the pest is not present leading to inefficiencies and a waste of natural resources. Our plan is to establish field experiments that utilize predatory mites only in areas affected by TSSM based on TSSM monitoring/sampling data. This will lead to a substantial reduction in the number of predatory mites required for controlling TSSM. We expect better performance by the predatory mites since they are only applied where there is prey (spider mites) increasing their efficiency. Performance Measures will be an economic analysis that will be conducted using a partial budget to compare site-specific pest management with the standard practice. Management practices that result in reduced cost of production and maximize farm profits are likely to be easily adopted by growers. Our goal is to use various extension outlets including strawberry newsletters, Electronic Data Information Systems (EDIS) and field days to ensure that we reach as many growers as possible. We believe that extension agents play an important role in providing growers with new research information. We will be working closely with the county extension agents to arrange our strawberry field days and on-farm demonstrations. They will also assist us in arranging the program for the fall and spring strawberry meetings in 2011and 2012. 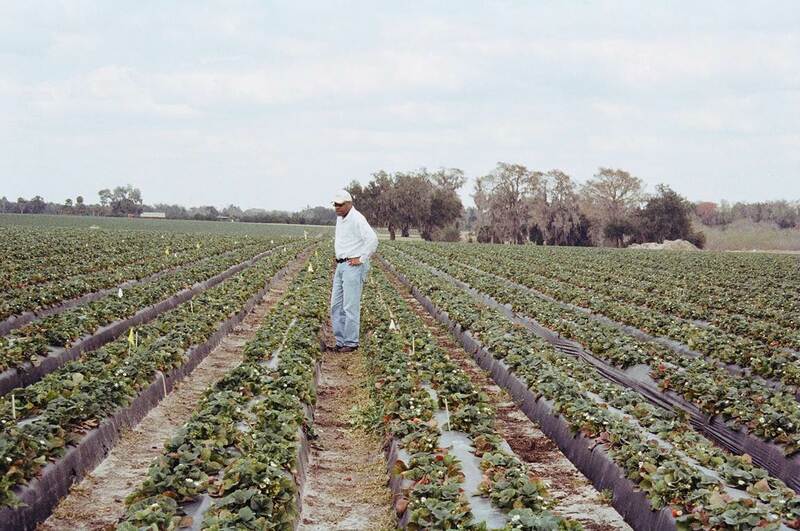 The target is both small and large scale strawberry growers in Florida. As such we will translate the scientific information into a language understandable to the public (growers, consumers). Performance measures will be based on the number of extension articles that are published, number of growers participating in the on-farm demonstrations and field days, and website hits to the Small Fruit and Vegetable IPM Laboratory website.